The Jack M. Toms ’69 Track of Champions will be dedicated Saturday to honor a legendary coach. The dedication will take place about 4:45 p.m. during halftime of a men’s soccer game against Bridgewater College on Shellenberger Field during Homecoming activities. Dr. Toms retired this summer from his position as men’s head cross country and men’s and women’s indoor and outdoor track and field coach after 31 years. 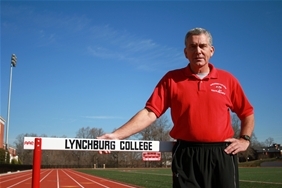 The most successful coach in the history of the athletic program, Dr. Toms built his teams into national powerhouses, dominating the ODAC and finishing strong in the region. He remains as athletic director. Dr. Toms is one of six inductees who will be enshrined in the U.S. Track & Field and Cross Country Coaches Association (USTFCCCA) Hall of Fame later this year. While building his teams, he has overseen the steady progress of the Hornet athletic department as a whole. Lynchburg annually boasts multiple conference championships, All-Americans, and NCAA title contenders. Last fall, the LC program ranked ninth overall in the Learfield III Cup. Dr. Toms was named Coach of the Year 68 times by the Old Dominion Athletic Conference (ODAC ) and 26 times by the NCAA South/Southeast Region.